The second of the testimonials is about Shamim Shahid, senior journalist from Peshawar working with national and international organziations. The suicide bomber had asked for me by name, I was told after the attack on the Peshawar Press Club. He said he was a guest of Shamim Shahid, the press club staff who were at the gate and miraculously survived after he had blown himself up, told me. The police constable at the gate initially let him go after he claimed he was my guest but could not answer some questions. He became suspicious of a bulge (of a suicide jacket, in later turned out) under his shirt. As he started to move away the constable asked him to stop but when he didn’t, the constable grabbed hold of him. That was when the bomber blew himself up. I heard the explosion on the road. I was two minutes away from the press club, the first to arrive at the scene after the bombing. I was the press club president at the time. We had been receiving threats all that year when the operation against the militants was at its peak northeast of Peshawar in Swat. 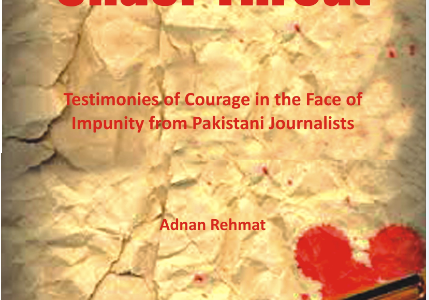 This had to be the most traumatic incident in my life, seeing dead bodies scattered at the gate of the press club, seeing that the threats we had been receiving actually materialized into battered bones and blood splattered at the door of the journalists’ citadel. I had been receiving threats from Taliban about my views on militancy and for working with Voice of America (VOA). And there were others, several over the years, but let me tell you about one that I survived after the press club attack without even knowing someone was planning to target me. I was on a visit to Afghanistan in January 2013. I often go there in relation to my work and to see friends. But this was a private visit – to attend funeral of a friend. I stayed in Kabul with a friend. I never trusted hotels, having survived the bombing of Intercontinental Hotel in Kabul. In the city I called an Afghan journalist who I had helped release from jail in Pakistan. When he got my call, he said he was coming over to see me. After we talked – he told me later – he got a call from the Taliban who wanted to see him about a story they wanted covered. My friend told them he couldn’t go with them because he was coming to Kabul to see a journalist from Pakistan. When the Taliban asked who the Pakistani journalist was, he inadvertently gave them my name. I left Kabul that afternoon. In view of security concerns, I usually turn off my mobile phone and remove the SIM while travelling. For the hours I travelled to Peshawar, with a break in Jalalabad where I stopped to get dry fruits for my family, I couldn’t be reached. When I left Jalalabad, I saw American troops along the road at Bhatikot, quite a few of them stopping and checking cars. I slipped into Pakistan at Torkham without stopping at the checkpoint to get my visa stamped – again a security measure because one has to travel through the tribal areas before reaching Peshawar. Many of the immigration staff on both sides are associated with the intelligence machines of their respective countries and I had reasons – from my previous run-ins with security people – not to reveal my whereabouts. Usually those travelling to Afghanistan are safe but those coming in are monitored and killed if that is the intent. The murder of Afghan journalist Hashim Zada is a case in point. Once in Peshawar, I put back the SIM in the phone and the first call I got was from a VOA colleague in Islamabad. He was frantic asking where I was and if I was okay. Minutes later, I got a call from VOA in Washington who said if I had to travel I should ask for security coverage. No one said what was going on. I thought I had alarmed them because my phone was off for a long time. That night my colleague from VOA called again. “Can you leave Peshawar now?” he said. “There is a threat of an attack against you.” It was late and I couldn’t have driven to my village in the dark. I locked up the house and had the guards on alert. As alarmed as I was, I had no idea about the gravity of the situation till I heard from VOA in Afghanistan the next day. They said the American security personnel had been at their office asking about me. They claimed I had been kidnapped because I hadn’t returned to Pakistan because they had checked with the immigration. Later I learned that the Americans and the Pakistani security officials had intercepted a telephone conversation from Taliban speaking about targeting me. I somehow, unknowingly, managed to stay out of trouble because I left Kabul before I had meant to. I had been very vocal throughout the Afghan Jihad, then later through Talibanization and post-2001 period in my criticism of the Taliban, the Pakistani policy of chasing an imagined strategic depth in Afghanistan and denouncing militancy. I have also served as bureau chief of The Nation and Pakistan Today newspapers in Peshawar. I have managed to stay safe so far but all these threats have restricted my movement and my work. No local papers now carry my comments and I cannot speak on public forums anymore.